The DS2 Ultra DAC is a universal and flexible digital to analogue converter, protected by an elegantly durable casing. It enjoys filtration technology for optimum sound performance. 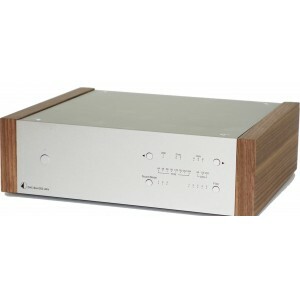 Pro-Ject DAC Box DS2 Ultra DAC combines a sleek aesthetic with an effortlessly universal and flexible digital to analogue converter. The design showcases full DSD256 support, upsampling of all input signals to 768kHz from USB along with coaxial and optical inputs. As a result, it offers high-resolution playback, a dynamic sound field and a rich bass sound free from distortion. Combine with other models in the DS2 family for a full, high-calibre setup. You will love full DSD capability (up to DSD256) over PCM. USB input allows conversion of hi-res audio data up to 32-bit and 768kHz, while all other inputs fully support 24/192kHz of HD music data in a fully asynchronous mode. Up to 768kHz PCM and 11.2MHz in DSD are supported for high-quality digital playback. In particular, the DAC utilises a "DSD Direct Path" which allows the audio signal to bypass the modulator which reproduces the original sound from DSD audio source. In a first for Pro-Ject, the model showcases four layers of PCB which enable the use of the shortest, symmetrical paths between the important components. The DAC Box DS2 Ultra is mounted in a sizeable aluminium and steel case, which helps to avoid penetration of electrical and mechanical interferences. For increased protection, the internal chassis is crafted from a steel sheet. DAC Box DS2 ultra utilises an external adaptor which further eliminates possible influences of mains interference. Every stage of DAC Box DS2 ultra has a separate power supply with very advanced filtration technology for increased sound performance. The DS2 Ultra enhances RS DACs with a different sound character thanks to tube design which creates a warm, rich sound quality.